I had never heard of Marilyn Chin. But there I sat in the hazy Smith Theatre, listening to the petite, flip-flop-clad lady unfold her Chinese heritage, her voice’s rich resonance baptizing life into her words. Peppered with rhetorical questions and salted with snark, Marilyn Chin’s poetry invited the audience into conversation. As she discussed her experience with assimilation, I thought back to my years of insecurity with my Nigerian identity. During my childhood, I tugged at my belly, my hair, my skin. I hunched in over myself. But I remember watching a spoken word from YouTube during youth group, the same lines which had echoed through my house the entire week prior because my mom, the youth leader, had been so fascinated by the video. Ears straining to keep up with the whiplash tempo, the laughing cadence, I snapped my fingers, riveted by the rain of spitfire, desperately beckoning the words barked out of the poets’ lips to be mine. A tandem of voice and pulse, spoken word went beyond sonnets and “thou”s and lofty declarations of love; it playfully teased out slant-rhymes and sidestepped the conventions of language. Poetry, I discovered, could be as unorthodox as I wished, and listening to the crowd of adroit artists (cough-SarahKay-PatrickRoche-BlytheBaird-OmarHolmon-cough) has since stirred a hunger. Maybe I am looking for truth, naked and unholy. Maybe I write because I’m looking to sing what could be my gospel, to scream it in the shower, to spit it into the mic, to whisper it in an ear, to let it breathe ink and paper and dust. While I write, I’ve knocked on Petrarch’s door, revisiting the poetry I once scoffed, imbibing in myself a greater appreciation for the art. Analyzing syntax and diction is what I love to do—maybe because I regularly eye my friends’ texts. (There’s a world of difference between “ok” and “Okay.”) While I am yet to be convinced that every inch of a poem is birthed from divine inspiration, I nevertheless believe that the spectrum of poetry—from spoken word to the coffee-stained margins—contains a delicateness that ought to be explored with careful hands and open eyes. As a writer, I wish to infuse electric vulnerability in my writing, inviting readers and listeners to unwind, to laugh, to have conversation. Eunice Braimoh finds herself in a limbo between cultures: in her room hangs the Nigerian flag, while Maryland’s mosaic fusion has grafted itself into her heart. As a writer exploring vulnerable curiosity, she wishes to symphonize conversation regarding race, gender, and diversity. When not effusively fangirling over slam poetry and intricate word-play, Eunice can be found writing (and rewriting) her own poetry and fiction. Previously recognized with two Regional Keys from the D.C. Metro Region, Eunice recently received a Silver Key for her poem “in which icarus does not drown”. She will be attending University of Maryland, College Park as an English major starting this fall. 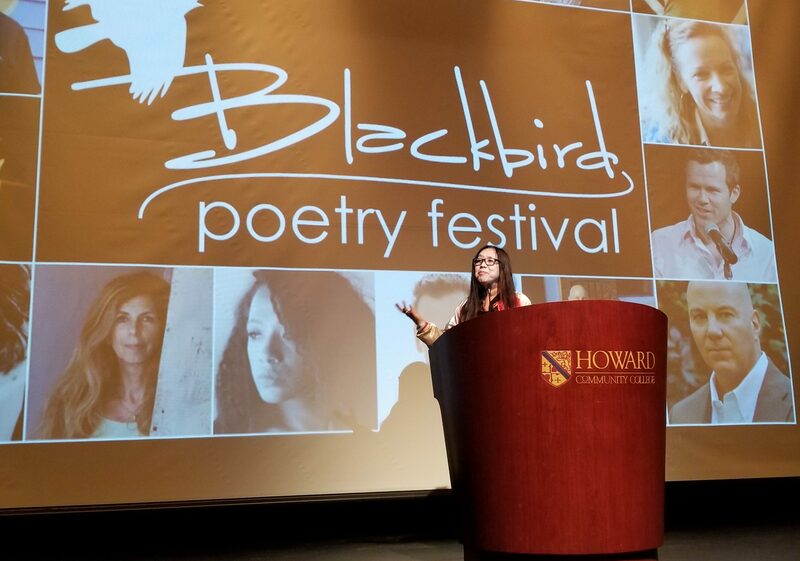 By Laura Yoo in Blackbird Poetry Festival, Guest post, Student programs on June 22, 2018 . “I wish to infuse electric vulnerability in my writing, inviting readers and listeners to unwind, to laugh, to have conversation.” A clause like this tells me she is well on her way. I look forward to reading more of this young lady’s work. The University of Maryland is lucky to claim her.